An extensive new resource on agroecology has just been made available by Biovision, following the first phase of the Advocacy for Agroecology (A4A) project, of which IPES-Food is a key partner. The “Agroecology Info Pool” (www.agroecology-pool.org) was launched last month at the 2nd Global Conference of the Sustainable Food Systems Programme - One Planet Network. 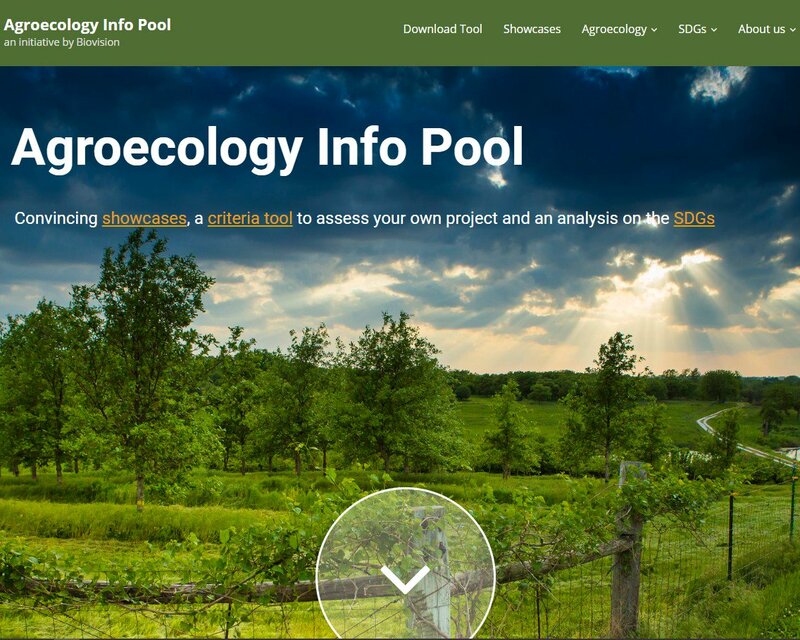 The Agroecology Info Pool contains convincing cases, a criteria tool to assess projects or policies, and an assessment of the impacts of various agroecological interventions on all Sustainable Development Goals. This website serves as a platform to provide evidence, knowledge, and experiences on the impacts and multiple benefits of agroecology. Through the A4A project, Biovision, IPES-Food, and other partners are assessing how current funding for agricultural research, development, and extension services is allocated, and to what extent it supports conventional systems versus sustainable (and particularly agroecological production). My story is probably typical. Husband fell into an affair with a woman at work and left me,I felt my life was over and my kids thought they would never see their father again. i tried to be strong just for the kids but i could not control the pains that torments my heart, my heart was filled with sorrows and pains because i was really in love with my husband. Every day and night i think of him and always wish he would come back to me, I was really upset and i needed help, so i searched for help online and I came across a website that suggested that Lord Spiritual can help get ex back fast. So, I felt I should give him a try. I contacted him and he told me what to do and i did it then he did a (Love spell) for me. 28 hours later, my husband really called me and told me that he miss me and the kids so much, So Amazing! !that was how he came back that same day,with lots of love and joy,and he apologized for his mistake,and for the pain he caused me and the kids. Then from that day,our Marriage was now stronger than how it were before, All thanks to Lord Spiritual. he is so powerful and i decided to share my story on the internet that Lord Spiritual is a real and powerful spell caster who i will always pray to live long to help his children in the time of trouble, if you are here and you need your ex back or your husband moved to another woman, do not cry anymore, contact this powerful spell caster now. +2348136219493, God bless you sir.. I am Cloud by name. Greetings to every one that is reading this testimony. I have been rejected by my husband after three(3) years of marriage just because another woman had a spell on him and he left me and the kid to suffer. one day when i was reading through the web, i saw a post on how this spell caster on this address covenantsolutiontemple@gmail.com , have help a woman to get back her husband and i gave him a reply to his address and he told me that a woman had a spell on my husband and he told me that he will help me and after 2 days that i will have my husband back. i believed him and today i am glad to let you all know that this spell caster have the power to bring lovers back. because i am now happy with my husband. Thanks for Dr.Covenant. His email: covenantsolutiontemple@gmail.com OR CALL/ WhatsApp Number:+2349057353987. heal from broken heart" Love spell from dr.Noble brought my husband back"contact templeofjoyandprosperity1@gmail.com to help you get your Ex lover back urgently after breakup/divorce" After 12years of marriage, me and my husband has been into one quarrel or the other until he finally left me and moved to TX to be with another woman. I felt my life was over and my kids thought they would never see their father again. i tried to be strong just for the kids but i could not control the pains that torments my heart, my heart was filled with sorrows and pains because i was really in love with my husband. Everyday and night i think of him and always wish he could come back to me, I was really worried and i needed help, so i searched for help online and I came across a website that suggested that Dr Noble can help get ex back fast. So, I felt I should give him a try. I contacted him and he told me what to do and i did it then he did a Love spell for me. 11hours later, my husband really called me and told me that he miss me and the kids so much, So Amazing!! So that was how he came back that same day,with lots of love and joy,and he apologized for his mistakes,and for the pain he caused me and the kids. Then from that day,our Marriage was now stronger than how it were before, All thanks to Dr Noble. he is so powerful and i decided to share my story on the internet that Dr.Noble is a real spell caster who i will always pray to live long to help his children in the time of trouble, if you are here and you need your ex lover back or save your marriage fast. Do not cry anymore, contact this powerful spell caster Dr.Noble now. Here’s his contact: Call/WhatsApp him: +2348145643630 ,Email him at: templeofjoyandprosperity1@gmail.com , http://ineedmyexbackdrnoble.blogspot.com/2018/08/urgent-love-spell-to-fix-your-broken.html ,Your kindness will never be forgotten Great DR NOBLE.